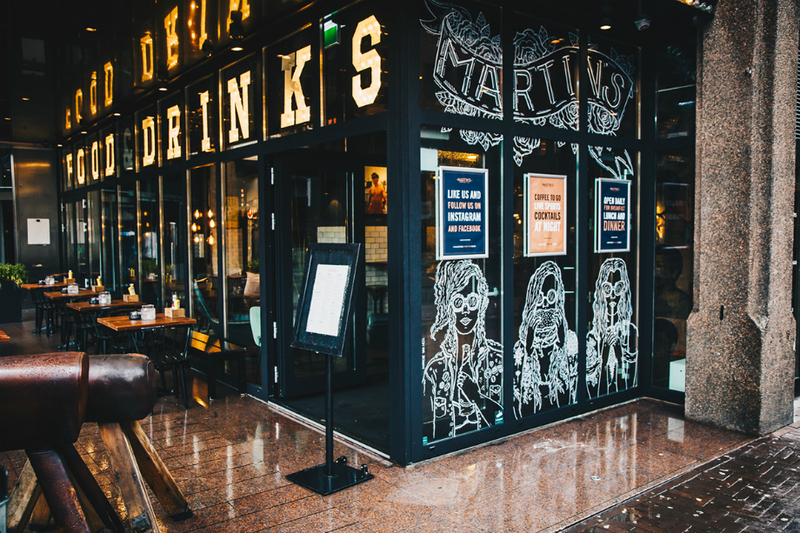 Amsterdam has a rich history when it comes to beer brewing and distilling Dutch jenever and gin, so it’s no surprise the city is packed with bars and café’s for drinks from early in the afternoon until late at night. From authentic Brown Café’s where the true Amsterdam spirit is still alive to hotspots where students gather and cocktail bars for a classy night out, there is so much to do. Whenever the sun is out, locals head to the first terrace or rooftop bar they can find to soak up some vitamin D while enjoying a drink or three. Read on to find your way through the immense range of options the city has to offer. We created the Ultimate Amsterdam Bar Guide for you! If you want to dive into true Amsterdam culture you should head to one of the brown cafes in Amsterdam. The bars are called this way because of their, often a bit outdated but all the more cozy, wooden interior. These are the best places to go for beer tasting in a relaxing atmosphere, while mingling with locals. You’ll be welcomed by a cheerful bartender serving you anything from Heineken and specialty beers to Dutch Jenever. A Van Wees Distillery is a famous local tasting room and local distiller of craft jenevers and liqueurs in the Jordaan-district. This historical pub, restaurant and tasting room serves Van Wees’ finest spirits along with comfort food, beer and fine wines. Their atmosphere is what Dutchies call a Brown Café, named after the use of dark wood in the interior. 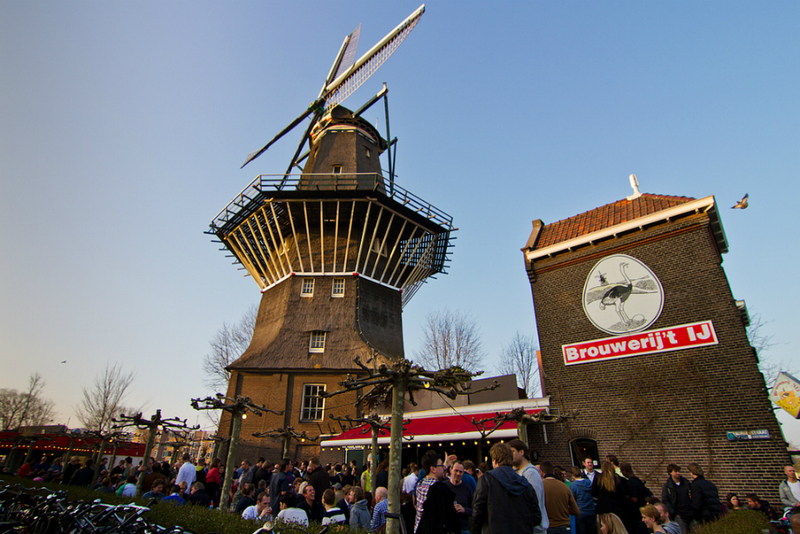 Brouwerij ‘t IJ is the most well-known craft breweries in town, located next to an original windmill in Amsterdam East. They have been naturally brewing characteristic craft beers since 1985. Enjoy one of the 55 different freshly-brewed drafts at the bar or have a seat on their wide outside terrace. The Biertuin (Beergarden) has locations in both the city center and the East district of Amsterdam. They are specialized in craft beers and generous portions of comfort food. Combine this with the relaxing atmosphere and cheerful service and you’ll be sure to have a good time here. They have over 20 brew on tap and 130 bottles brews, including Brooklyn Lager, Irish Red and various Dutch specialties. De Biertuin also has the Netherlands only ‘hopinator’, a device that adds fresh ingredients to the beer as it is tapped. Café Brecht is a Berlin style café located in the city center. You won’t find a hip interior here, they like it cozy and timeless, you might even call it retro. Sit down on the terrace for some old-fashioned people watching or head in for fairly priced drinks and a warm atmosphere. Whenever the sun is out in Amsterdam, locals head out for a drink on a terrace. No matter the temperature. Whether it’s on a rooftop or at one of the many (heated) terraces, the city has an amazing offer when it comes to outdoor spots. The Waterkant is one not to miss on any sunny day in Amsterdam. Their terrace is known to be one of the nicest in town, inspired by the Surimane River. On any given day when the sun is out this place is packed with enjoyers of the good life. Order an ice-cold Parbo beer and some typical Surinamese dishes like roti and chicken. If you’ve never tried the Suriname cuisine before, this is definitely worth the try! Hannekes Boom is a cozy bar built from recycled materials with an amazing waterside terrace overlooking the Amsterdam canal. On warm days, the enormous terrace is packed with sunbathers and in winter people curl-up in comfortable chairs in front of the open fire, enjoying the occasional live music and organic food. 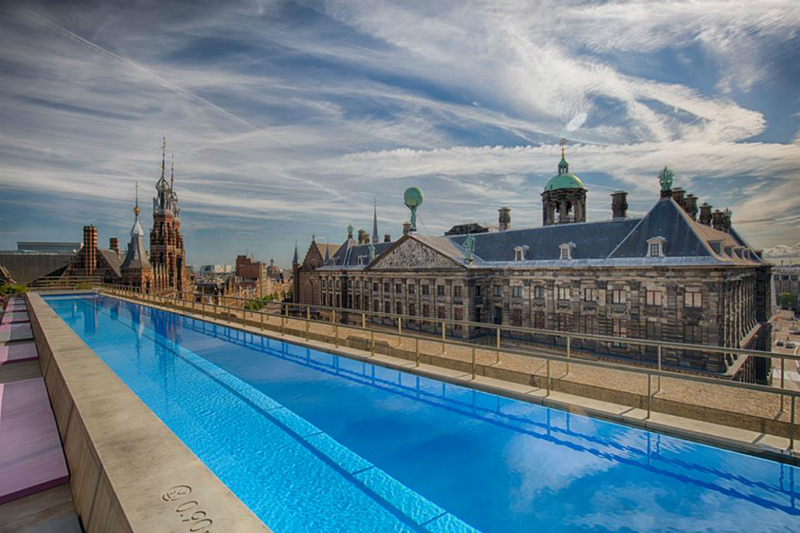 One of the rooftop bars with the best view in town is the W Lounge on the top floor of the luxurious W. It’s not the highest but offers stunning 360-degree view over the city and the historical Royal Palace located on Dam Square. On their menu you’ll find all that is new in the world of mixology in combination with mouthwatering bar bites. Unique to this bar is that they have a rooftop pool, perfect for paddling with a cocktail in summer! Arrive early and stay late, with beautiful people, weekly events and DJ performances. The high-end champagne and cocktail bar Twenty Third Bar is located on the 23rd floor of the five star Hotel Okura. It’s a spot exquisite drinks and Michelin star worthy bites with a magnificent view over Amsterdam. A sommelier can advise you on their best wines and champagnes and their bartender will be happy to shake up a fruit-filled cocktail. It’s the perfect spot for after dinner or pre going out drinks in style. 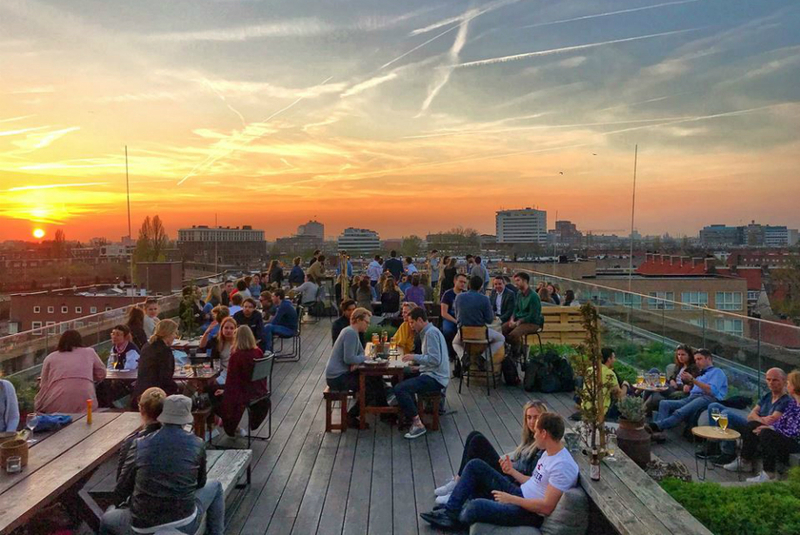 Bar Hopp is a rooftop beer garden on top of Casa in Amsterdam East. There is no inside area, so this is one to go to when the weather is pleasant. 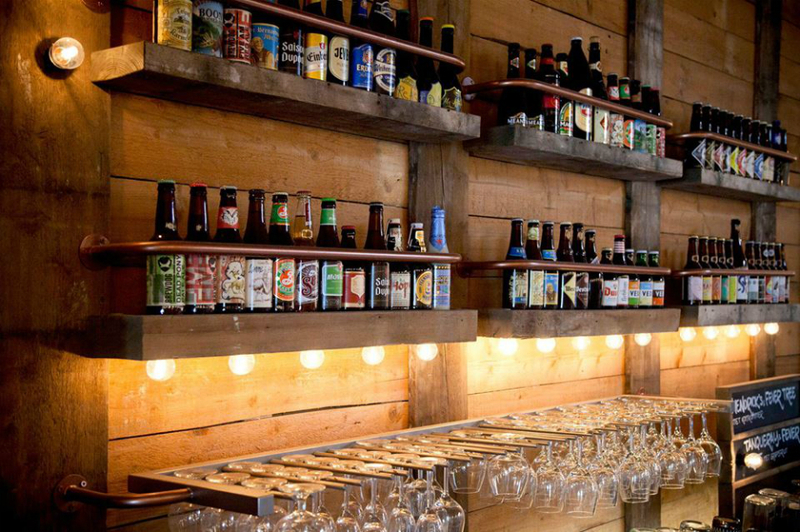 Their menu offers a great selection of local and international craft beers. And if you’re hungry, their tasty burgers and flammkuchen will go perfect with that. The Netherlands is known for their big love for soccer, so it’s no surprise that there are a lot of bars in Amsterdam showing live sports. But they don’t only show live soccer. Boxing, tennis and football are also well represented in the cities sports bars. Looking for other live entertainment? Bars all over town host musical evenings with live local and International musicians performing. A fun night out guaranteed! Coco’s Outback is an Aussie style sports pub serving tasty bar food and a large selection of beers and cocktails. They feature all major sports events on their 30 screens. Drop in for a relaxing afternoon or evening while watching your favorite game. At night the pub turns into a club with live DJ sets and a shooter bar next door with over 70 different shots. Dancing on the tables is allowed! Check out their sports agenda on their website to know what’s on. Good to know: happy hours are at 6:00 and 10:00 p.m.
Waterhole is a live music bar in the heart of the city with a line-up varying from pop to rock and anything in between. You can go there for a quick bite and drinks or head up to their Tap & Dine restaurant on the first floor serving delicious comfort food like burgers and ribs. The fun thing about this place is that you’ll be seated at a table with your very own beer tap! The music program is filled with gigs from international and local artists, the whole week through. Indie Mondays, 80’s Funk and Rock on Thursdays and Friday night Rock. Whatever music genre you’re in to, Waterhole is the perfect spot for a musical night out. Martin’s Social Club is located on Rembrandt Square and offers you sports, music, food and drinks. Open all day long, you can stop by for a steaming cup of coffee, English Breakfast or a late-night dinner American style. During sports you can enjoy a beer from their extensive craft beer menu. Next to showing sports, Martin’s Social Club often hosts live music evenings with inspiring local artists in all genres. Have a look at their Facebook page for all upcoming events. Sports and unlimited Spare Ribs. Now that’s a fine combination, isn’t it? Satellite Sports café is located on Leidse Square and is open for breakfast, lunch and dinner. Their extensive food menu is available all throughout the day, so if you fancy pancakes at night or a burger in the morning, this is your spot! Their huge outdoor terrace is equipped with televisions as well, so you can keep watching the game wherever you’re seated. During colder days and evenings, they will turn up the heaters to keep you comfortable and warm. It might have taken a while, but Amsterdam is finally catching up when it comes to its Cocktail scene. All over the city you can find both flamboyant and more relaxed cocktail bars with bartenders that master their craft. Because mixing up a perfect cocktail is truly an art! Door47 is the first speakeasy cocktail bar in Amsterdam. Hidden from the eye, this sophisticated bar serves authentic quality drinks, perfect for a date night. The antique barware, dim lighting and tin ceiling makes for a cozy yet elegant atmosphere. 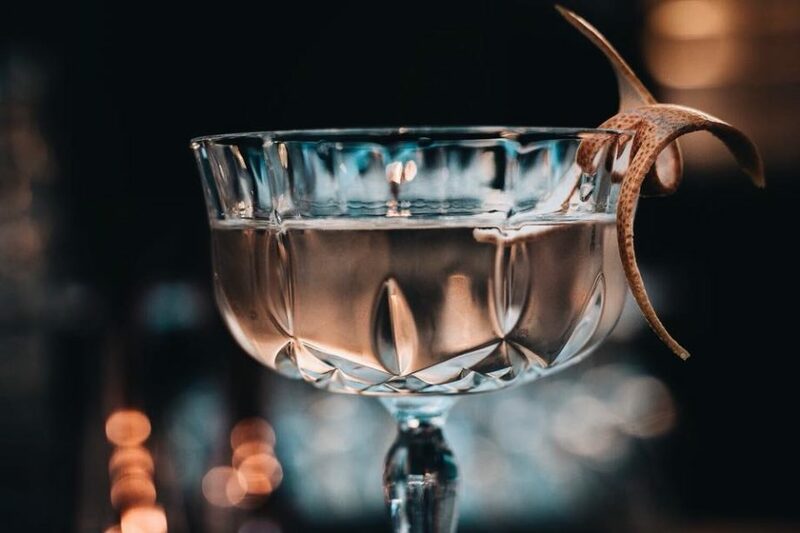 The Flying Dutchmen was nominated for “best cocktail bar 2018” and we know why. The bartenders here know their craft and are passionate about the art of mixology. The cocktail creations highlight the qualities of every ingredients they use, with a perfect balance in flavors. 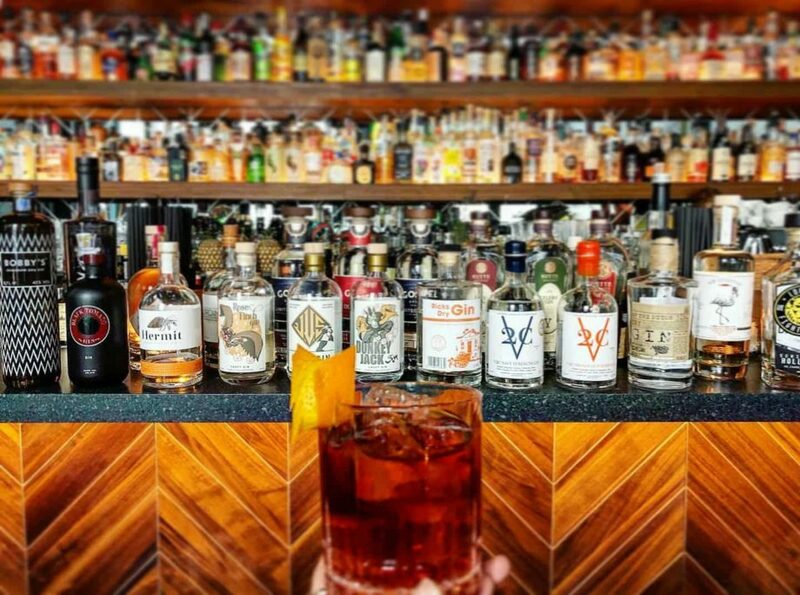 They focus on classics but with over 500 bottles they’re able to shake up about everything you want. 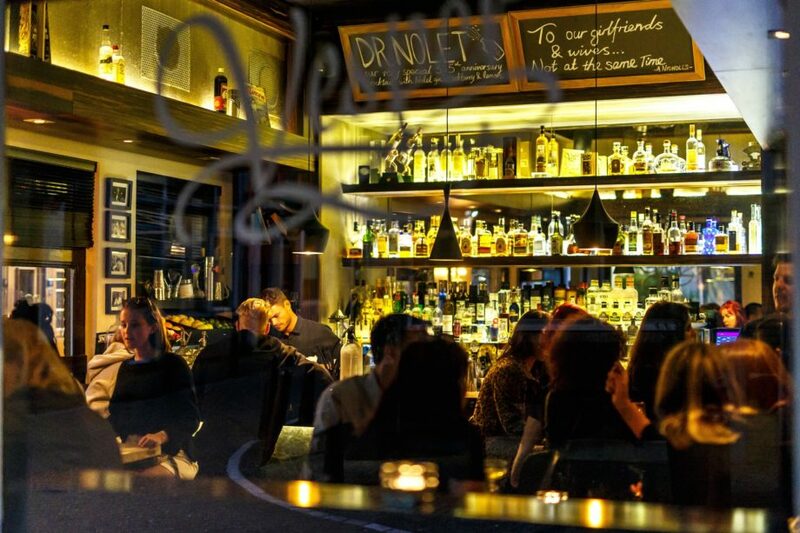 Vesper is often listed as one of the best bars in Amsterdam Jordaan district. With its laid-back ambience, quality cocktails and friendly service, it’s a hotspot amongst locals for many years now. Expect it to be busy during both the weekend and weekdays! Ready to hit the town and dance the night away? 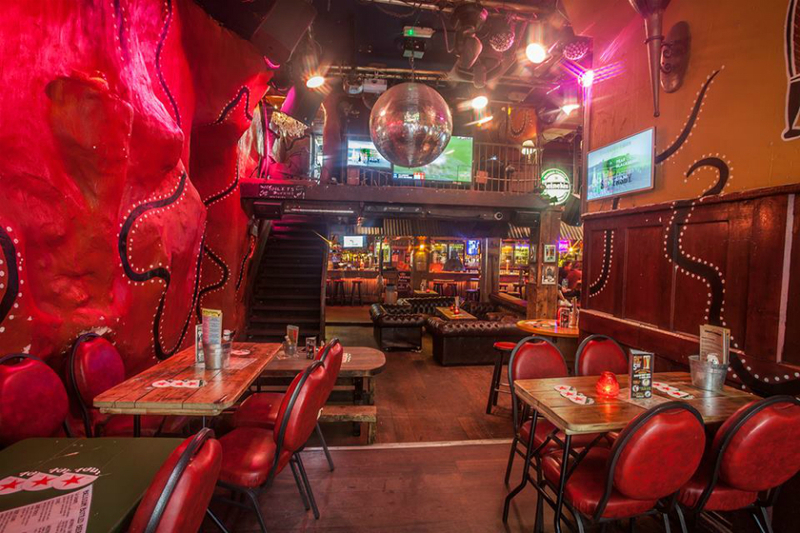 Amsterdam has a lot to offer when it comes to clubs and dancing cafés. The two most well-known going out areas are located around Leidse Square and Rembrandt Square, both offering numerous spots with music in all genres. From Techno at Club NL and Shelter to R&B and EDM at the beautiful Supperclub. Students? Head over to the Chicago Social Club and end your night at the Bubbels with Guilty Pleasures blasting through the speakers until late (or early). 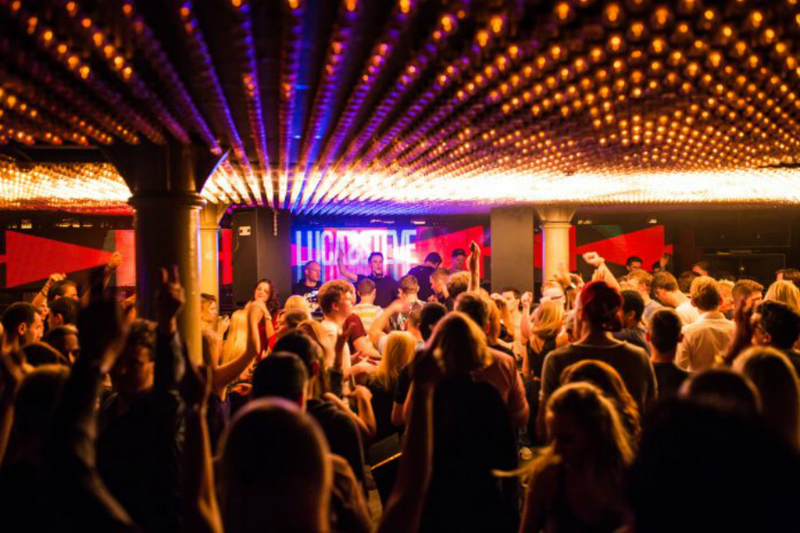 The Jimmy Woo has been around for quite some time and has become a household name in Amsterdam’s Nightlife scene. This high-end club has one of the most intriguing interiors in town with their downstairs ceiling made entirely out of lightbulbs. Make sure to dress up and be ready for mingling, enjoying fine cocktails and dancing amongst beautiful people. 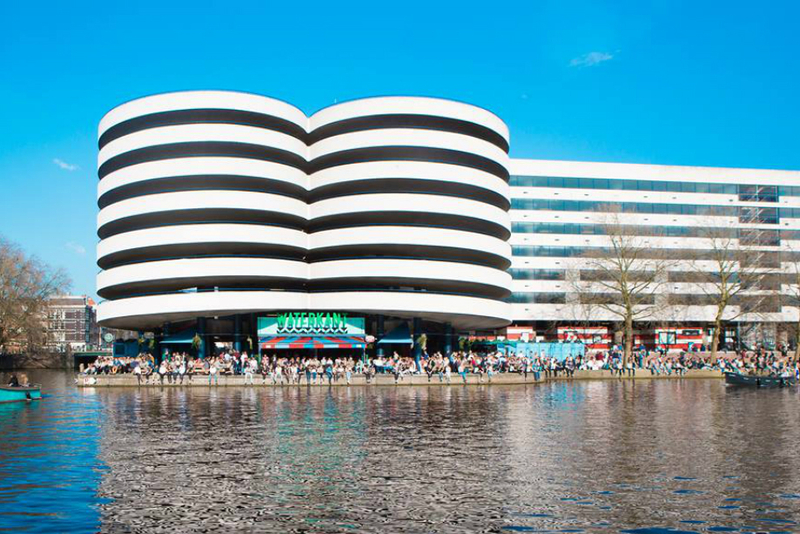 The Escape is located in the epicenter of the Amsterdam’s nightlife scene: the Rembrandt Square. The club is one of the biggest in town and offers a wide variety of music, from house and electro to techno and R&B. The club is conveniently located in the heart of the party scene, making it easy to hop to other clubs and bars in the area such as club AIR. 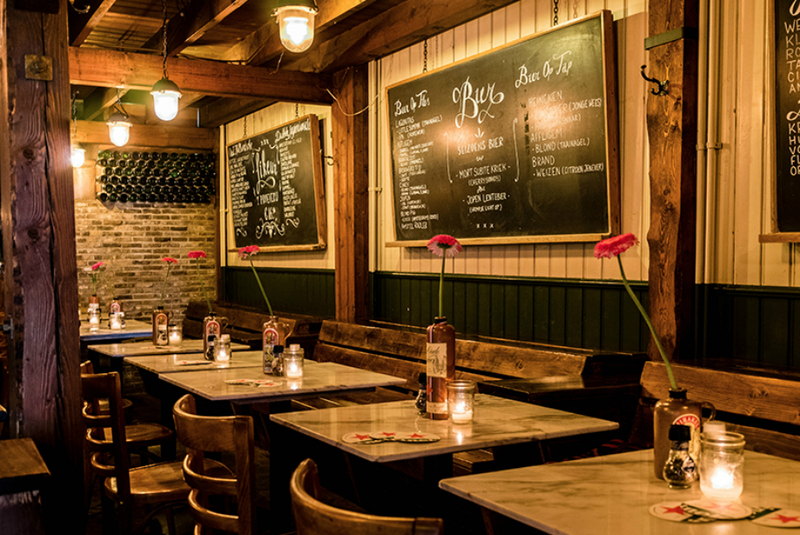 De Tulp is a colorful hotspot in the midst of the bustling De Pijp. 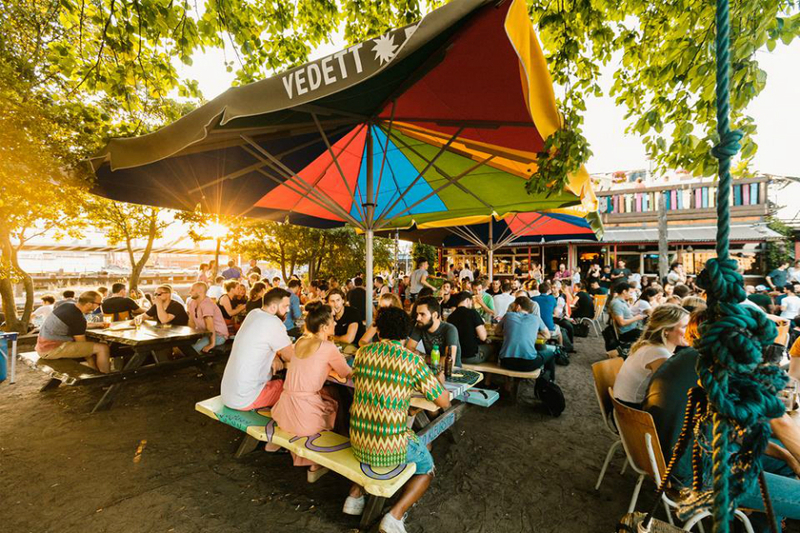 During the day they are open for tasty tropical dishes and by night their bars turns into a night café with live DJ sets, a lot of drinks and even more dancing. It often gets very crowded on weekends, so we advise you to go there early. Load up with some snacks and get ready for the night! The Chin Chin Club is one of the newest additions to Amsterdam’s nightlife scene. 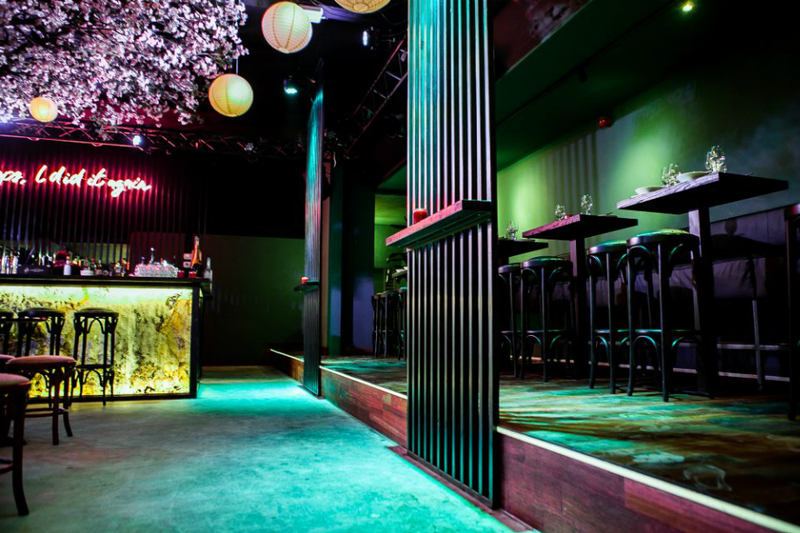 This hotspot offers Asian food during the evening, after which it turns into a vibrant club after 10:00 p.m. If you go early, you get in without having to pay a ticket for the night program. Go in either for their tasty food or just to get some cocktails and to get your game on at one of the ping pong tables. During weekends the place is always packed with people shaking the week off to R&B and Pop music. Fun fact: they also have a karaoke booth! Bar Bukowski is a spot on the east part of town you can both start and end your day at. At night this always lively place turns into a local hang out, serving a large array of craft beers, specialty soft drinks and cocktails. On the weekends they turn the volume up, with R&B, pop and old school guilty pleasures blasting through the speakers. Dance the night away or head upstairs to sit down with your drinks. Looking for Gay Bars in Amsterdam? Head over to the Reguliersdwarsstraat, located between Leidse Square and Rembrandt Square. 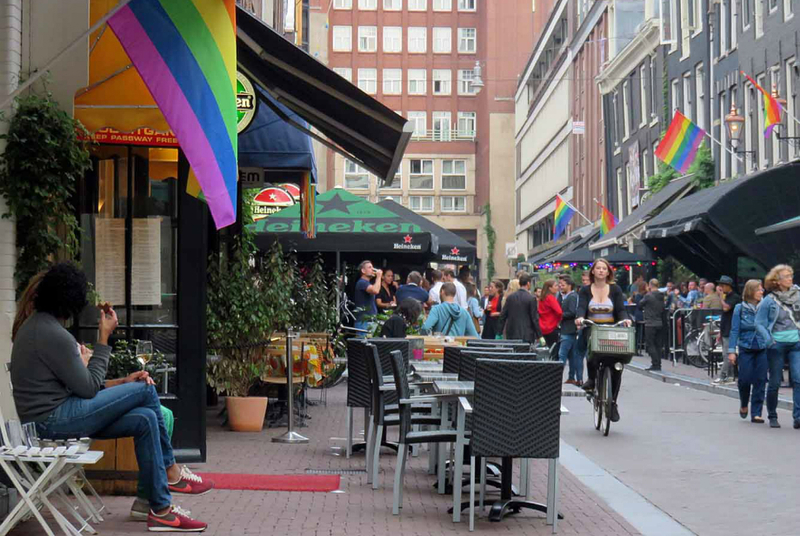 This street has an amazing offering of bars and clubs, where gay and straight are more than welcome! The Soho and Taboo are two favorites, both fully packed on weekends. The Nyx is a club where everyone comes together for a night of dancing to the best beats amongst beautiful people. Who says that bars are just for hanging around and chatting? Amsterdam has some awesome unique bars in store for you. From Arcade games to Karaoke and Cocktail tastings. Perfect for a night out with friends, date night or any other celebration. Get ready for some action! 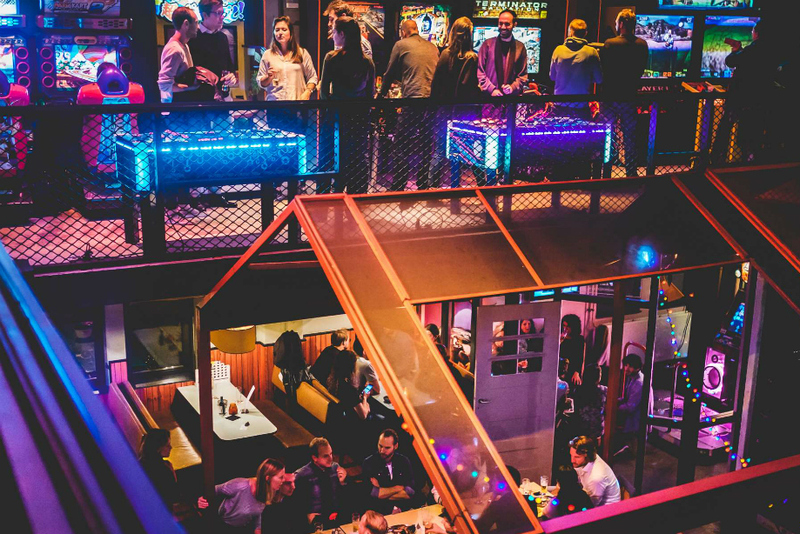 In the middle of the red light district you’ll find the Barcade Ton Ton Club, a 70s and 80s styled bar plus arcade hall. 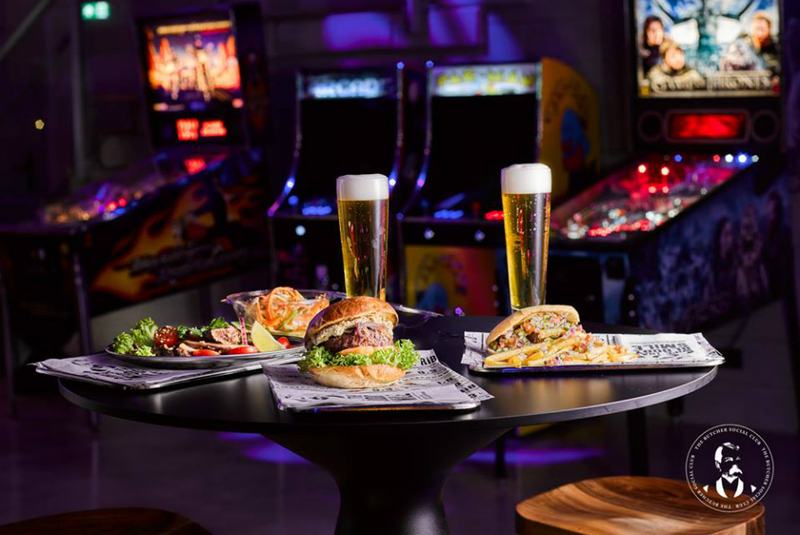 Get some drinks to loosen up and challenge your friends or date during all types of iconic table and arcade games. Their menu offers over 25 craft beers amongst other beverages and a good selection of bar food. A fun night guaranteed! One of the most (in)famous bars in Amsterdam would be the Banana Bar. This adult bar located in the Red Light District is not your average. The ladies that serve you have a few tricks up their sleeves, so if you dare, ask them about it. Tip: this is the perfect spot for a Bachelor party! Cocktails, dancing and Karaoke? The Duke of Tokyo is the spot to be for anyone who wants to sing their heart out in one of the 8 karaoke booths. Gather your friends, sip on one of their tasty cocktails for some courage and let the fun begin! 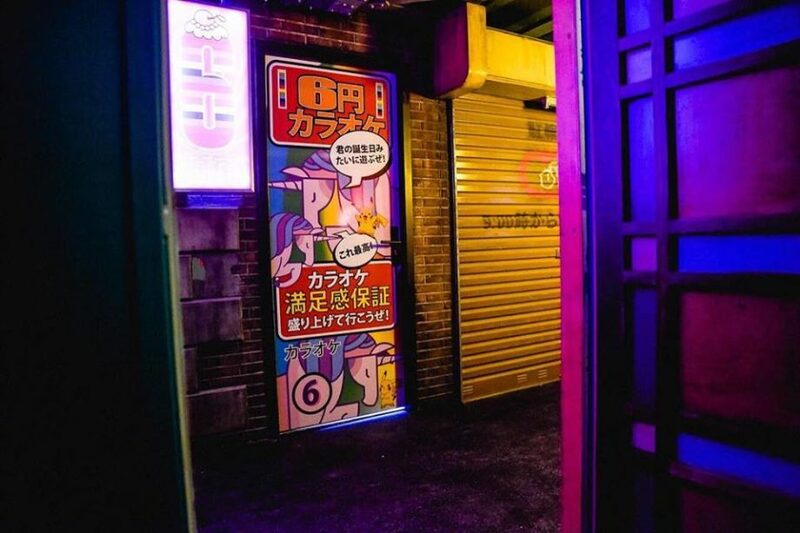 Their interior is designed like a Tokyo neighborhood, making you feel like you’re in a totally different world for the evening. The Butcher Social Club is an adult playground located at the A’Dam Tower in the North part of town. This bar and restaurant offers you Haute cuisine comfort food, an amazing selection of craft beers and cocktails. The most fun part is that they often host parties and have an array of (arcade) games scattered around the immense place. This is a spot to hang out from early until late, perfect for a fun date or a wild night out with friends. There is literally no place cooler in Amsterdam than the Ice Bar. At a temperature -10 degrees Celsius everything in this bar is made entirely out of ice. From the bar, to the chairs and the art on the walls. Don’t worry about freezing your hands off, the Ice Bar will provide you with appropriate clothing before heading in to the bar. There you go! 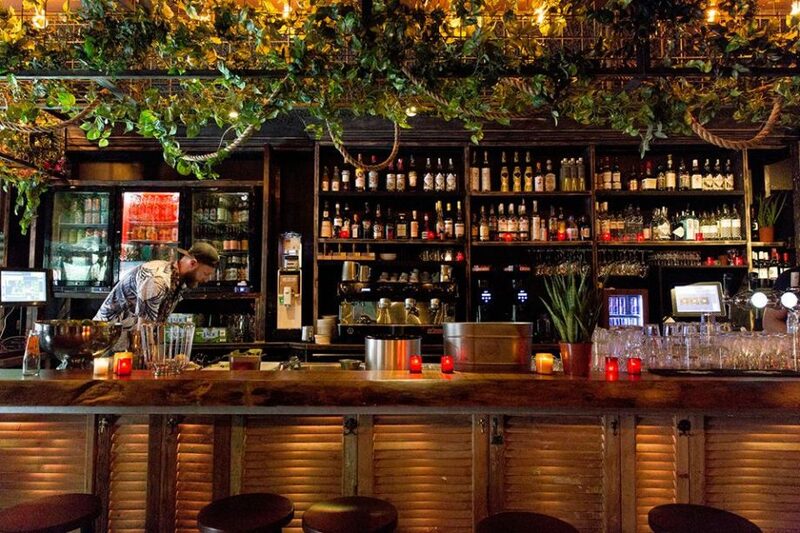 You now know all about the best bars in Amsterdam. Still looking for more? Check out our full overview of café’s, terraces and cocktail bars.